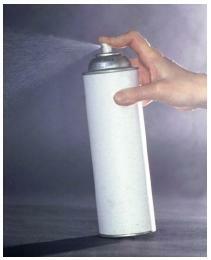 Aerosols are collections of tiny particles of solid and/or liquid suspended in a gas. The size of particles in an aerosol ranges from about 0.001 to about 100 microns. (A micron is one-millionth of a meter.) The most familiar form of an aerosol is the pressurized spray can, which can dispense anything from hair spray to enamel paint to whipping cream. Aerosols are produced by a number of natural processes and are now manufactured in large quantities for a variety of commercial uses. They are also at the root of a number of environmental problems, including air pollution and destruction of ozone, a natural component of Earth's atmosphere. Aerosols are commonly classified into various subgroups based on the nature and size of the particles of which they are composed and, to some extent, the manner in which the aerosol is formed. Although relatively strict scientific definitions are available for each subgroup, these distinctions may become blurred in actual practical applications. The most important of these subgroups are fumes, dusts, mists, and sprays. Fumes. Fumes consist of solid particles—ranging in size from 0.001 to 1 micron—suspended in a gas. Probably the most familiar form of a fume is smoke. Smoke is formed from the incomplete combustion of fuels such as coal, oil, or natural gas. The particles that make up smoke are smaller than 10 microns in size. Dusts. Dusts also contain solid particles suspended in a gas, usually air, but the particles are larger in size than those in a fume. They range from about 1 to about 100 microns in size, although they may be even larger. Dust is formed by the release of materials such as soil and sand, fertilizers, coal dust, cement dust, pollen, and fly ash into the atmosphere. Because of their larger particle size, dusts tend to be more unstable and settle out more rapidly than do fumes, which do not settle out at all. Mists. Mists are liquid particles—less than about 10 microns in size—dispersed in a gas. The most common type of mist is that formed by tiny water droplets suspended in the air, as on a cool summer morning. If the concentration of liquid particles becomes high enough to affect visibility, it is then called a fog. A particular form of fog that has become significant in the last half century is smog. Smog forms when natural moisture in the air interacts with human-produced components, such as smoke and other combustion products, to form chemically active materials. Sprays. Sprays form when relatively large (10+ microns) droplets of a liquid are suspended in a gas. Sprays can be formed naturally, as along an ocean beach, but are also produced as the result of some human inventions such as aerosol can dispensers of paints, deodorants, and other household products. Volcanic eruptions are major, if highly irregular, sources of atmospheric aerosols. The eruptions of Mount Hudson in Chile in August 1991 and Mount Pinatubo in the Philippines in June 1991 produced huge volumes of aerosols that had measurable effects on Earth's atmosphere. Acid rain: A form of precipitation that is significantly more acidic than neutral water, often produced as the result of industrial processes. Chlorofluorocarbons (CFCs): A group of organic compounds once used widely as propellants in commercial sprays but regulated in the United States since 1987 because of their harmful environmental effects. Dust: An aerosol consisting of solid particles in the range of 1 to 100 microns suspended in a gas. Electrostatic precipitator: A device for removing pollutants from a smokestack. Fume: A type of aerosol consisting of solid particles in the range 0.001 to 1 micron suspended in a gas. Mist: A type of aerosol consisting of droplets of liquid less than 10 microns in size suspended in a gas. Ozone layer: A region of the upper atmosphere in which the concentration of ozone is significantly higher than in other parts of the atmosphere. Smog: An aerosol form of air pollution produced when moisture in the air combines and reacts with the products of fossil fuel combustion. Smoke: A fume formed by the incomplete combustion of fossil fuels such as coal, oil, and natural gas. Spray: A type of aerosol consisting of droplets of liquid greater than 10 microns in size suspended in a gas. Stack gases: Gases released through a smokestack as the result of some power-generating or manufacturing process. The remaining atmospheric aerosols result from human actions. Some, such as the aerosols released from spray-can products, go directly to form aerosols in the atmosphere. Others undergo chemical changes; for example, oxides of nitrogen and sulfur are produced during the combustion of fossil fuels such as coal and oil. These oxides may be converted to liquid or solid nitrates and sulfates, which are then incorporated into atmospheric aerosols. The synthetic production of aerosols for various commercial purposes has become such a large industry that the term aerosol has taken on a new meaning. Average citizens who know little or nothing about the scientific aspects of aerosols recognize the term as referring to devices for dispensing a wide variety of products, including hair spray, furniture polish, and spray paint. The concept of aerosol technology is relatively simple. A spray can is filled with a product to be delivered (such as paint), a propellant, and sometimes a carrier to help disperse the product. Pressing a button on the can releases a mixture of these components in the form of an aerosol. Most aerosols, however, are actually more complex than this simple description. An aerosol pesticide, for example, must be formulated in such a way that a precise amount of poison is released, enough to kill pests, but not so much as to produce an environmental hazard. Similarly, an aerosol throat spray must deliver a carefully measured quantity of medication. The production of commercial aerosols fell slightly in the late 1980s because of concerns about the ozone (see Environmental factors below) and other environmental effects. By 1992, however, their manufacture had rebounded. In that year 990 million container units (bottles and cans) of personal aerosol products and 695 million container units of household products were manufactured. Aerosol technology has made possible vastly improved combustion systems, such as those used in fossil-fueled power generator plants and in rocket engines. The fundamental principle involved is that any solid or liquid fuel burns only at its surface. The combustion of a lump of coal proceeds relatively slowly because inner parts of the coal cannot begin to burn until the outer layers are burned off first. The rate of combustion can be increased by dividing a lump of coal or a barrel of fuel oil into very small particles, the smaller the better. Power-generating plants today often run on coal that has been pulverized to a dust or on oil that has been converted to a mist. The dust or mist is then thoroughly mixed with an oxidizing agent, such as air or pure oxygen, and fed into the combustion chamber. The rate of combustion of such aerosols is many times greater than would be the case for coal or oil in bulk. A number of environmental problems have been connected to aerosols, the vast majority of them associated with aerosols produced by human activities. For example, smoke released during the incomplete combustion of fossil fuels results in the formation of at least two major types of aerosols that may be harmful to plant and animal life. One type consists of finely divided carbon released from unburned fuel. This soot can damage plants by coating their leaves and reducing their ability to carry out photosynthesis (using light to break down chemical compounds). It can also clog the alveoli—air sacs in human lungs—and interfere with a person's respiration. A second type of harmful aerosol is formed when smokestack gases, such as sulfur dioxide and nitrogen oxides, react with oxygen and water vapor in the air to form sulfuric and nitric acids, respectively. Mists containing these acids may be carried hundreds of miles from their original source before conglomeration occurs and the acids fall to Earth as acid rain. Considerable disagreement exists about the precise nature and extent of the damage caused by acid rain. But there seems to be little doubt that in some locations it has caused severe harm to plant and aquatic life. Ozone depletion. A particularly serious environmental effect of aerosol technology has been damage to Earth's ozone layer. This damage appears to be caused by a group of compounds known as chlorofluorocarbons (CFCs) which, for more than a half century, were by far the most popular of all propellants used in aerosol cans. Scientists originally felt little concern about the use of CFCs in aerosol products because they are highly stable compounds at conditions encountered on Earth's surface. They have since learned, however, that CFCs behave very differently when they diffuse into the upper atmosphere and are exposed to the intense solar radiation present there. Under those circumstances, CFCs decompose and release chlorine atoms that, in turn, react with ozone in the stratosphere (the atmospheric region approximately 7 to 31 miles above Earth's surface). As a result, the concentration of ozone in portions of the atmosphere has been steadily decreasing. This change could prove to be very dangerous, since Earth's ozone layer absorbs ultraviolet radiation from the Sun and protects living things on our planet from the harmful effects of that radiation. Technological solutions. Methods for reducing the harmful environmental effects of aerosols such as those described above have received the serious attention of scientists for many years. Consequently, a number of techniques have been invented for reducing the aerosol components of things like stack gases. One device, the electrostatic precipitator, is based on the principle that the particles of which an aerosol consists (such as unburned carbon in stack gases) carry small electrical charges. By lining a smokestack with charged metal grids, the charged aerosol particles can be attracted to the grids and pulled out of the emitted smoke. Efforts aimed at solving the CFC/ozone problem have not yet been as successful as those used to combat other forms of air pollution. Chemists have developed and tested a number of substitutes for CFCs as aerosol propellants. One group of special interest has been the hydrochlorofluorocarbons (HCFCs), CFC-like compounds that also contain hydrogen atoms. Most CFC-substitutes tried so far, however, are very expensive, not efficient enough as a propellant, or equally harmful to the environment. Another risk associated with commercial aerosols is their use as recreational drugs. Inhalation of some consumer aerosol preparations may produce a wide variety of effects, including euphoria, excitement, delusions, and hallucinations. Repeated sniffing of aerosols can result in addiction that can cause intoxication, damaged vision, slurred speech, and diminished mental capacity. This article was very helpful to me. I'm doing a science project on the affect of hairspray on a plants growth. The information about aerosols really helped, thanks. Is it possible to have a structurally strengthed aerosal solid. Possibly graphite epoxy? what is a intensive property and extensive property? May I know what are the compounds present in Aerosol Sprays? Thank you so much!!! Great for my science project on spray paint affecting environment!!! Thx! Love ya! Thank u so much. This info was very helpful in my research on plant nutrient absorption. However, I didn't quite get your view about how aerosols can be artifically formed; u mean its just by storing/containing a content in a pressurized can? That's all? thank you for your information.it helped me for my projectwork. this article was very helpful I am doing a presentation on spray paint. and I would like it if it had some good envier mental impact fact but it was helpful.